Minimally invasive treatment of many cardio-, neuro-, and peripheral vascular conditions has surpassed open surgeries driven by numerous benefits, including fewer major adverse events, shorter hospital stays, and faster recovery. These endovascular procedures would not have been possible without fluoroscopy, which provides real-time images of the location and movement of therapeutic catheters inside the body. However, over the past two decades, there’s been increasing scientific and clinical evidence that chronic exposure to fluoroscopy, which emits low-dose ionizing radiation, is putting interventional medical professionals at risk for serious health conditions, including cancer. To date, there has not been an economic analysis of the impact of these health-related occupational hazards. 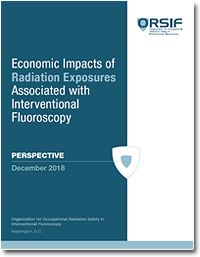 The Organization for Occupational Radiation Safety in Interventional Fluoroscopy (ORSIF) sought to quantify the economic costs associated with common health consequences of chronic exposure to ionizing radiation, specifically the development of cancer and orthopedic injuries. Based on the incidence of these adverse effects, ORSIF estimates the annual economic costs to be at least $49 million in the United States alone. This estimate excludes the treatment of non-acute medical conditions, such as precursors to cataracts, cognitive decline, and risks to reproductive health. It also does not account for turnover costs of experienced physicians nor potential litigation from physicians or patients. Absent investment in radiation exposure control technologies, economic costs will likely increase based on the continued shift to minimally invasive procedures. 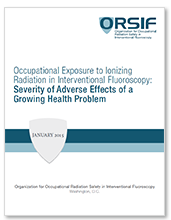 To raise awareness of the serious radiation and musculoskeletal hazards associated with working in interventional fluoroscopy laboratories, and generate awareness of and support for medical professionals and hospitals for new and better ways to create the safest work environment possible for those dedicated to the wellness of others.